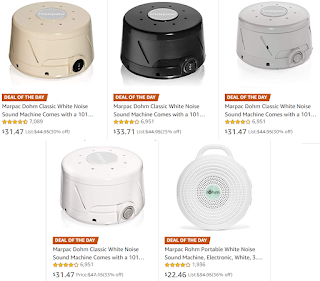 Marpac Dohm Portable All-Natural White Noise Sound Machine $22.46 Marpac Dohm-DS All-Natural White Noise Sound Machine $31.49 (Reg $49.99) + Free Shipping. Popular white sound machines and lowest price they have been. White noise promotes relaxation prior to sleep by providing a constant, soothing sound for your brain to settle on. This helps quiet the mind and keeps you from focusing on disruptive sounds which interfere with the process of falling asleep. This is more like the sound of having a Fan on all night (without the air), not one of those machines that makes other sounds like oceans etc.. The white sound then blocks out all other noises and sounds like cars outside etc... and helps you sleep.